The user-experience needs of canines — like those of many special audiences — have long been overlooked. But we are now in the Year of the Dog, and the convergence of mobile connectivity, voice interaction, and image recognition promises to open the gates to canine-technology adoption. UX designers everywhere should prepare for this new technology frontier by educating themselves about the research methods and design guidelines appropriate to this audience. Dogs are mobile: Most dogs accompany their humans on daily excursions, and some even travel the world. To be dog-friendly, devices must be portable and offer long battery life. Dogs are social: Canines place a high value on interpersonal relationships. They maintain strong ties to members of their immediate pack, as well as many weak ties to others throughout their area (typically via scent exchanges). Thus principles of social psychology, such as behavioral modeling, are especially effective in motivating canine behavior. Dogs eat things: Many dogs will eat anything they can swallow, regardless of its nutritional value or taste. Small, indigestible devices thus present a major health hazard. Wearable devices should ideally be out of the wearer’s line of sight, to avoid temptation and accidental ingestion. Many dogs regularly undertake both local and long-distance travel. To be successful, devices must be portable, with long battery life, and easily attached to collars or harnesses for transport. These are just a few of the traits which distinguish canines from other types of users; but, designers must also keep in mind that not all dogs are alike. Dog user personas should be based on the particular types of dogs most likely to use the system. For example, working dogs don’t have time to explore complex interfaces — they need applications which offer immediate, actionable information and tools. When it comes to ecommerce, hairless dogs are more likely to shop for clothes; whereas the poodle mixes are unlikely to need clothing (as their natural coats already function as a sweater). Retail websites should collect breed information in order to offer personalized product suggestions. Luckily, dogs are quite accustomed to wearing harnesses, collars, (and in colder climates, jackets and sweaters), so the wearable revolution is a natural shift in device use for dogs. Activity tracking and exercise reminders. Especially older dogs are often known for their desire to sit around and sleep all day, so a reminder to get up and move around every 30 minutes can prevent excessive laziness. GPS location and turn-by-turn navigation. As dogs require constant walks, GPS navigation can ensure that they don’t get lost (and if they do, they can return home safely). Notifications and reminders. Especially on walks and during play sessions with other dogs, distractions abound. Notifications and reminders of upcoming obligations can bring dogs back from distracted flights of fancy. Telling time. Many dogs are known for their relative disregard of the schedules of others around them, waking their human companions when hungry, or being blissfully unaware of upcoming events during an enjoyable walk. While the time-telling functions of the typical wearable device are often an afterthought, keeping this feature front and center, helps dogs to function in a time-obsessed world. Augmented reality (AR) and virtual reality (VR) provide entertainment during downtime. Most domestic dogs experience periods of downtime in between walks and play sessions, while their humans have to go through the drudgery of work. During these periods of relative boredom, augmented reality and virtual-reality systems can provide stimulation and entertainment. However, these technologies must account for the limitations in dog vision (explored in more detail below), and provide safety features to allow dogs to maintain situational awareness while using the systems. Dogs can benefit from AR and VR technology, in the form of smart glasses and goggles to help curb boredom during downtime. However, these technologies will need to include accessibility considerations for the limitations of canine vision, particularly their limited color vision and acuity. 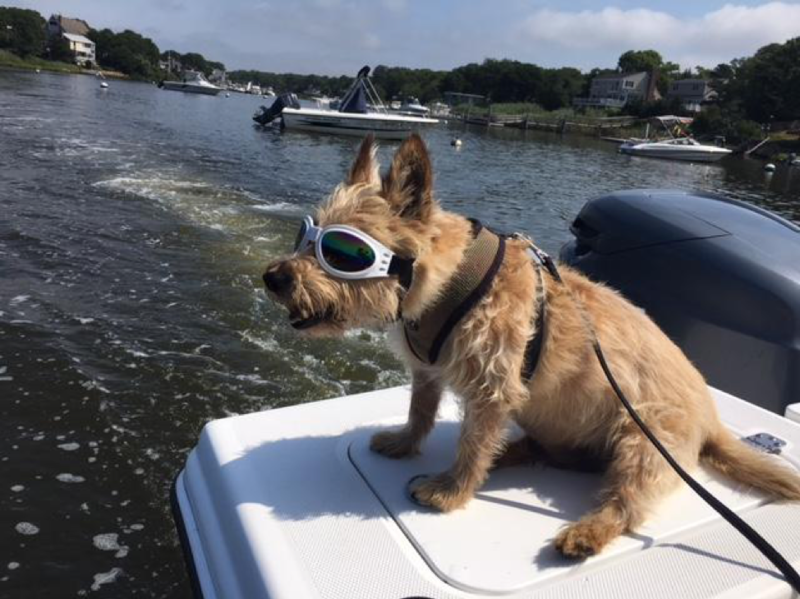 In addition, these systems will need to provide situational awareness for safety reasons, so that enthusiastic canines do not bump into walls (or fall from boats) during use. Consistency is critical. While consistency in any user experience is important, with dogs, it’s even more so. Experienced dog trainers will tell you that, for dogs to learn proper behavior, consistency in enforcing routines, expectations, and commands is critical. Some common UI culprits that provide extra difficulty for dogs are swipe ambiguity, gestures without signifiers, tap uncertainty for flat UI elements like ghost buttons, and unusual placement of common elements like navigation and search. Tap targets must be large. We recommend 1cm^2 for human tap targets, but paws (whether belonging to cats or dogs) require larger tap sizes (of at least 3-4cm^2, or even larger for Labradors and Great Danes). Gestures must be ergonomic for dog physiology. While many wearable interfaces now involve gestures such as swiping left or right to dismiss notifications or switch apps, these need to be modified for more ergonomic canine movements (such as “shake”). Dogs have a greater ability to move paws with precision up and down, but dogs’ range of motion along the horizontal axis is limited and relatively imprecise, so all gestures must account for this limitation. Dogs have a greater range of motion and more precision along the vertical axis with their paws (i.e. the “shake” gesture as seen here), whereas horizontal left-to-right motion is significantly more limited and imprecise. Therefore, UI gestures (such as swiping left) should not require fine motor control on the horizontal axis. 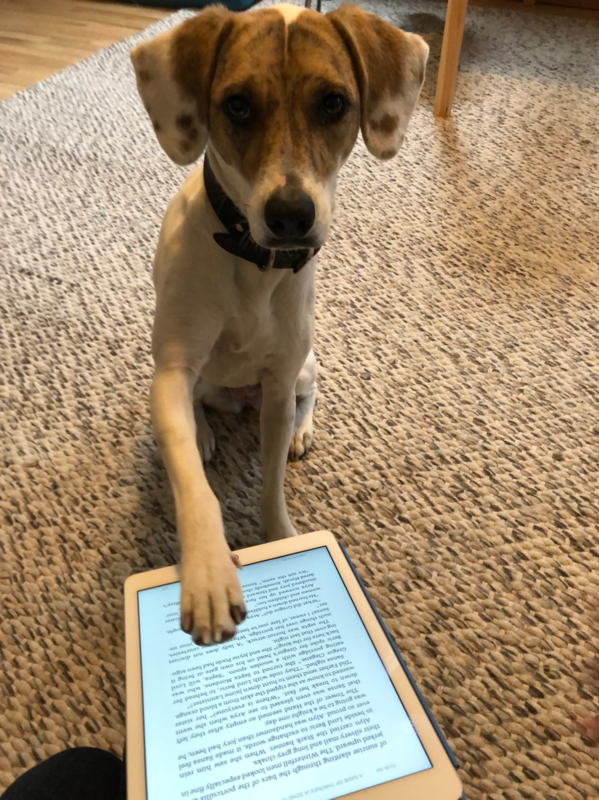 The Kindle app for iPad, requires a difficult (for dogs) horizontal swipe to turn pages. It also creates consistency problems by drifting from the conventional vertical scrolling most apps use to reveal more content. Color cannot be a primary indicator. Contrary to popular myth, dogs do see color, but they are dichromatic (i.e. red-green-yellow colorblind, like a fair portion of the human population). As a result, your interface cannot use the colors red, yellow, and green as the only method of distinguishing between UI elements. This follows our accessibility recommendations for humans as well. Fonts must be big. In addition to color-vision problems, dogs also have lower visual acuity (i.e. sharpness) and brightness sensitivity. This means that for dogs to easily be able to read the content and chrome in your apps, the font sizes must be large and have sufficient contrast against the background. 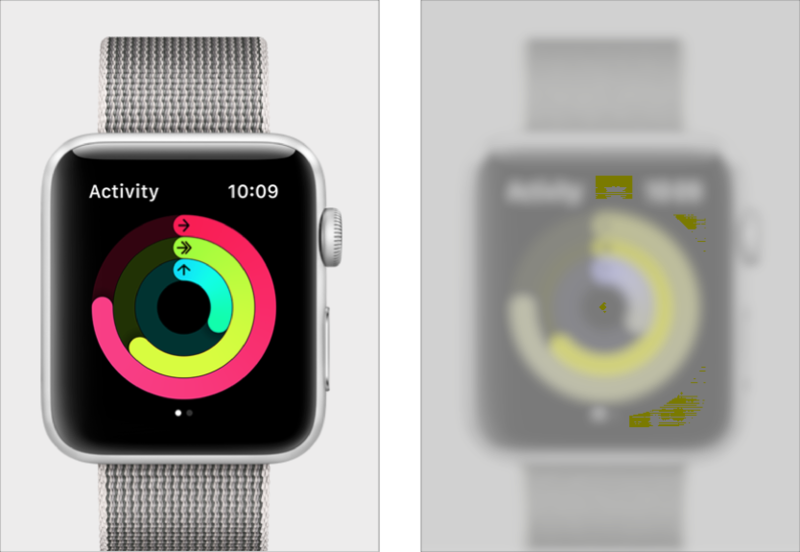 The same Apple Watch screenshot unprocessed (left), and run through a filter simulating dog vision (right), showcases how dogs have both reduced color perception compared to most humans, as well as brightness and acuity limitations. The UI rings are distinguished only through color, with no secondary method of identifying what they represent. Avoid the hamburger menu. The hamburger menu performs fairly poorly for humans; for dogs, it is even worse. As dogs’ memories are somewhat limited compared to humans, hiding global navigation options in a hamburger menu means that most of your content will be out-of-sight (and therefore out-of-mind for most dogs). In addition, the mere suggestion of hamburger (even in a metaphorical icon) is enough to distract perpetually hungry dogs and keep them from accomplishing their top tasks. If you are considering using pie menus as an alternative, think again — these menus are just as distracting for canine users. 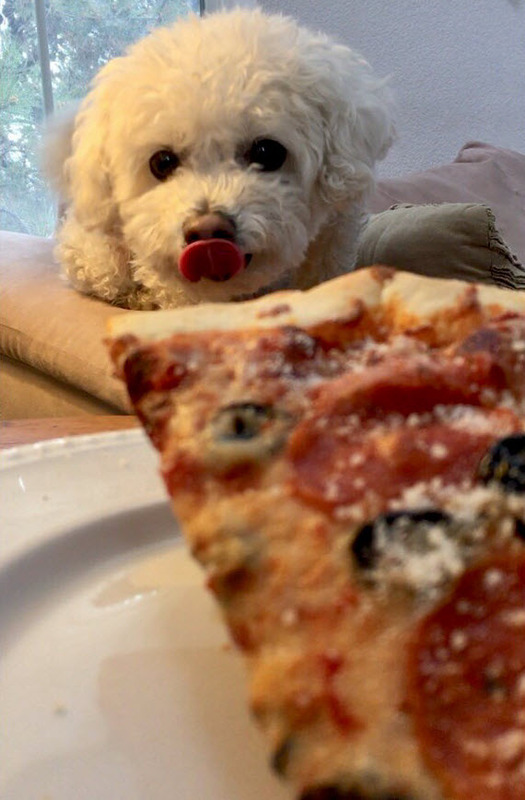 Dogs are likely to become distracted from their current tasks when they encounter either hamburger or pie menus —especially pie menus that bear any resemblance to a pizza pie. Discount usability testing with representative canines from your user population will provide the maximum insights for the lowest cost. As with humans, 5 dogs can help you uncover 85% of the usability problems that your interface will present to most dogs. Dogs have only been shown to be able to count to 5, therefore you can’t use post-test questionnaires (such as the NPS) with more than 5 options (but the SUS, with only 5 options per question, is okay). While in most cases we recommend giving human participants the full incentive payment at the beginning of the testing session (to clearly reinforce to users that their participation is voluntary and they can end the session at any time), with dogs it is better to give a partial incentive (in the form of a high-value treat) at the beginning of the session, and an additional incentive after each task in order to keep attention at maximum for the full session. Dog-friendly design is the natural next step in user experience. Invest now in understanding this audience to ensure your organization is ready for the exciting new opportunities just around the corner. Previous articleE-Commerce UX Case Study – How To Design A Fashion Store? Next articleWhy GIFs are important for UI interaction? And best Apps for making GIFs!